Try to determine file type of files—if this option is chosen, then the types of found files will be determined according to known data structures using Raw Search technology. Default size of file if size was not determined (MB)—the size of certain file types cannot be determined. This default size value is used for these files. Skip Temporary Internet folders—check this option to skip scanning of folders with temporary Internet files. Skip Temporary folders—check this option in order to skip folders of type “\Documents and Settings\<user>\Local Settings\Temp”. Skip Temporary files—check this option to skip files with the extensions tmp, bak and ~~~. 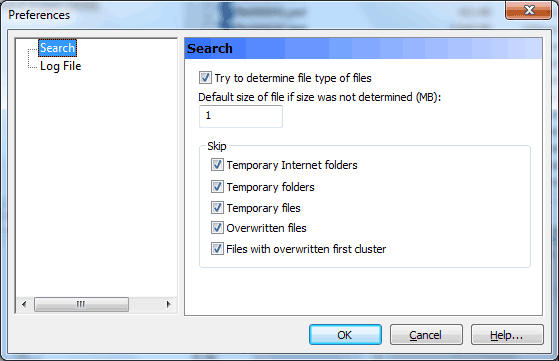 Skip Overwritten files—check this option to skip files which have been determined to be overwritten by other files. Skip Files with overwritten first cluster—check this option to skip files whose first cluster has been overwritten by other files.